Note: We'd love more shots of this! Break a deal - face the wheel! "I hope you have a big trunk... because I'm puttin' my bike in it. Wowe, neat bike.. seems like it might be newer than 76 though? Are you positive on the year? just saying IDK 4 sure./..
Hello, I am Bob. Me and my best friend, Aaron, are just checkin out anything on Profab and saw these posts. Aaron is a close relation to Dennis Parker, who made these frames here in F'n hot Phoenix, Arizona, where we have lived all our lives. I would just like to say that Cali was not the only place that had a BMX scene. Arizona has had a big off-road scene, which included many a dirt bike. Profab was not only a builder of the early BMX frames, but I believe from Dennis' first hand information that they were one of the first. In fact, he still has an original Profab tandem. I believe Dennis also made the very first DG frame and still has it. Not to mention the Flying W, which was one of the first mini's ever made. It was made for Wes Parker, hence the Flying W name. He had the first one and Aaron had the second one. Dennis and Charlie (Aaron's Dad) cut a section from the cranks and welded them back together to make them shorter when he and Wes were five and six (now they are 39 and 40, so do the math...Yes, that means 1976). 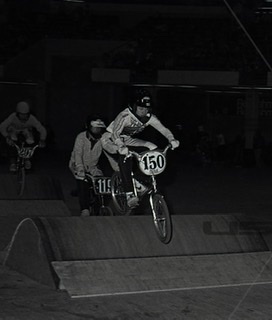 So to answer the question from bmx museumologist, that's a true confirmation on the 1976. Aaron and I would like to start a dialogue to compile the facts for Profab bmx. Any known survivors, please let us know what info you have so we can build a factual history here on BMX museum. We are also looking to buy any original frames. Tempting! !Since I have a Pro Fab Factory jersey!I'm an OM orig. from Phnx.